This map displays local public launch access points for the Lake. More than 100 restaurants at The Lake tempt you with menus that range from simple to the most exquisite gourmet meal. Many are located on or over-looking the water. Whether your style is casual or black-tie or anything in between, The Lake will have what you want. Full menus include continental cuisine, traditional Ozark Bar-B-Que and fish, homestyle cooking, buffets and "fast food". And let`s not forget the ice cream parlors and homemade fudge shops! The Lake area has mini-golf courses, go-kart tracks, amusement centers and waterparks, old time photoshops, the "Strip" just north of Bagnell Dam, arcades, movies, concerts, plays, annual events, festivals and fireworks. Some of the best musicians and comedians in the state stay right in The Lake region. An annual BluesFest is held in August and The Lake of the Ozarks Jazz Society events occur month January through November. The Dixieland Jazz Festival in October is one of the area`s favorites. The Lake of the Ozarks Chamber of Commerce will always have a current list of upcoming attractions. Shopping possibilities are simply endless at the Lake of the Ozarks. Malls, clothing stores offering business, evening and casual wear, specialty stores, home and decor, craft shops, art galleries, music stores, antique shops, flea markets, emporiums, and bazaars make this area a year-round mecca for shoppers. The largest top brand outlet mall in the state is located in the township of Osage Beach. All of this adds up to The Lake having anything that you could possibly need or want and being the perfect destination for the casual browser and those who love to shop `till they drop. The Lake of the Ozarks is well known for its excellent fishing. Largemouth Bass, Crappie, White Bass, Striper and Catfish take center stage for most Lake anglers. Through excellent management, regulation and stocking efforts of the Missouri Department of Conservation, Lake of the Ozarks has provided a number of state record catches over the past ten years including a 20.5 lb. hybrid bass, a 34 lb. drum, a 36 lb. buffalo, a 42 lb. muskie, a 91 lb. blue catfish and a 134 lb. 12 oz. paddlefish. 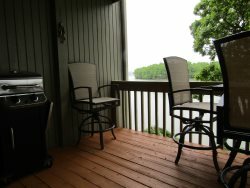 Whether you are a serious pro fisherman or out with the family for a day of relaxation and fun, the Lake of the Ozarks has what you want for a great fishing vacation. Throughout the year, hunters can pursue deer turkey, squirrel, rabbit, dove, duck, geese and quail in the forests, fields, farmlands, and on the waters at The Lake. Most hunting in the Lake region is done on private land with permission of the landowner. There are also some hunting preserves and some landowners offer land-lease packages for hunting. Information regarding fishing and hunting licenses, seasons, limits and Hunter Training in the state of Missouri is available with the Lake Area Missouri Department of Conservation.